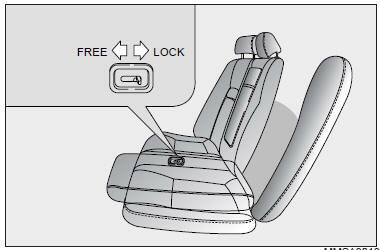 When the rear seatback lock lever (located on the backside of the rear seatback) is in the “LOCK” position, it is not possible to fold the rear seatback down by using the release lock lever. Should this happen, open the trunk and move the lock lever to the “FREE” position and use the release lock lever located on the top of he seatback to fold the rear seatback down. The rear seatback lock lever is designed to provide protection from unauthorized entry into the trunk.